Farm Pickup Only. We do not ship. Please check our home page for availability. Golden Comets are a Modern day egg laying strain of chicken. They are a cross between a Rhode Island Red and White Leghorn chicken. The hybrid vigor gives them the best traits of both breeds. Like leghorns they start laying earlier than any other breed and are prolific layers. 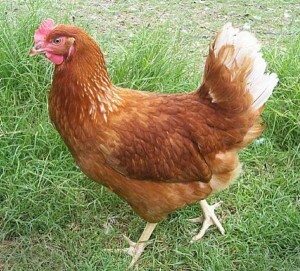 Like Rhode Island Red they have a pleasant temperament and are both cold and heat hardy. Temperament wise Comets are known for being very sweet and gentle. This makes them perfect for first time chicken owners. They often chose to interact with their owners instead of hanging out with their coop mates. Unlike many other breeds, small children can pick them up, hold them and carry them around. They are the perfect size for kids too – around 5 lbs. As far as egg laying goes, nothing out lays a Comet. Their eggs are very large and often a deep, red brown color. They can lay up to 330 eggs a year which means you’ll be getting about 7 eggs a week most of the year. Most heritage breeds only produce 3 to 5 eggs a week. This is why Golden Comet laying hens are usually the breed chosen by people who sell eggs at farmers markets. We like to call the color of Comets cinnamon and sugar. Some have a lot more sugar color on their cinnamon than others. Some have a white lace collar while other have a lot of white lacing on their wings and tail. Some may be very light red and some are a rich dark chestnut. The National Poultry Improvement Program, is a federal program with the sole intent of testing poultry for Pullorum and Typhoid. Our Golden Comets come from flocks that are certified Pullorum and Typhoid free through the NPIP program. To maintain this certification the breeding stock and chicks are kept inside to prevent contact with wild birds. At 16 weeks of age birds from each flock are also tested for Avian Influenza and Mycoplasmosis. What all this means is that you will be getting clean birds when you buy our Golden Comets. We do not raise the Comets from chicks. We buy them from an association of professional poultry farmers who have over 30 years of experience raising top birds till they are ready to lay. Here is a link for raising chickens for egg production. It is a good article that explains at what age chickens start to lay, how long they lay, why they stop laying and much more. I encourage you to CLICK HERE and read this article.